With 30 years of proven reliability and over 40 million users, DiSC® Classic remains the most trusted learning instrument in the industry. It is used worldwide in dozens of training and coaching applications, including organizational development and performance improvement. 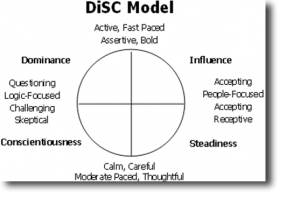 Designed to complement and supplement existing training programs, DiSC Classic can help improve communication, ease frustration and conflict, and develop effective managers and teams. The power of DiSC Classic is available on paper or online— just choose the response format and report that best meet your needs. Dominance: Direct and Decisive. D’s are strong-willed, strong-minded people who like accepting challenges, taking action, and getting immediate results. Influence: Optimistic and Outgoing. i’s are “people people” who like participating on teams, sharing ideas, and energizing and entertaining others. Steadiness: Sympathetic and Cooperative. S’s are helpful people who like working behind the scenes, performing in consistent and predictable ways, and being good listeners. Conscientiousness: Concerned and Correct. C’s are sticklers for quality and like planning ahead, employing systematic approaches, and checking and re-checking for accuracy. DISC® CLASSIC 2.0 DiSC Classic 2.0 on EPIC answers the growing demand for an online assessment with a personalized narrative report. The new report adds an informal, conversational style that brings to life all the elements of the original instrument. Plus, you’ll get an expanded narrative that brings the much-used Intensity Index to life. The DISC model was developed by Dr. William Moulton Marston in his book, The Emotion of Normal People (International Library of Psychology). Dr. Marston divided human behavior into two areas which he expressed along an axis. The first axis was defined as passive or active; the second axis was defined as antagonistic or favorable. By combining these two behavior patterns to form quadrants, Dr. Marston developed the DISC model, creating a predictor of how people will act and react (shown in the adjacent figure). The DISC model has developed into a universal language of observable human behavior. Each quadrant discusses one aspect of behavior. There is a considerable amount of discussion about the benefits of diversity within an organization, usually referring to cultural or ethnic diversity. By applying the DISC model to your personnel, you can begin to understand the diversity of human behavior and bring the benefits of incorporating this diversity into improving your company’s performance.